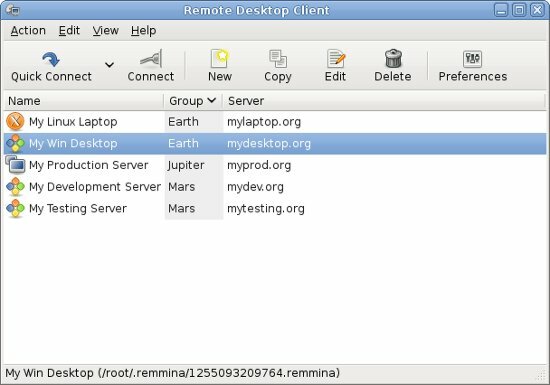 Remmina is a remote desktop client application developed using GTK+.The latest version is 0.9.*. Remmina is a great application for those who want to manage/control computers remotely. It’s an open source software (released under GPL license). It supports a lot of protocols including VNC (Virtual Network Computing), RDP (Remote Desktop Protocol), SSH, NX, Telepathy etc. Remmina has lot of cool features with simple ‘n’ easy to use user interface (full view mode is also supported and if the remote desktop has very high resolution then you can easily access that by scrolling view) with a lot of options to configure your favorite connection profiles. You can connect very quickly to your servers just put the address and start using it in few simple click. it will automatically select some popular plugin to support protocols such as VNC, RDP, SSH. You just authenticate (enter your login password) and hit [y]. That’s All.. now you can easily control your Home Planet’s computers.